We have reached this point every year: It’s a time when we experience exhaustion from heat and long days, and from first watching the kale, chard, and then squash, cucumber and cherry tomato plants succumb to their pests and fungal disease, turning brown and giving us no more. But it is also a time for planting our fall garden, and watching and waiting for these newly planted crops to provide what we need to feed ourselves, our CSAs and other customers. Here are some photos of what is growing for you in our September boxes and beyond. Here is part of our heirloom pumpkin patch. 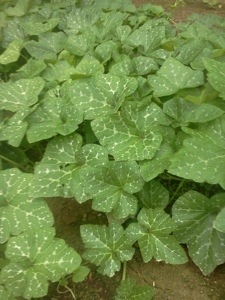 These are the leave of our Musquee de Province pumpkins. 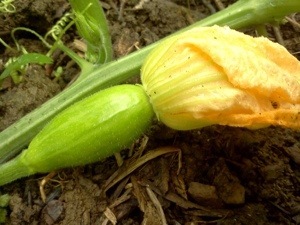 Here is a delicate squash in its infancy. 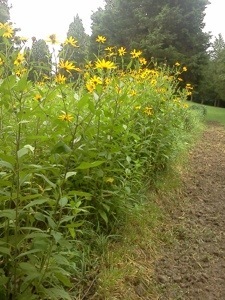 And this is our head high row of sun chokes, aka Jerusalem Artichoke. It’s just starting to bloom. It’s pretty, unique, yummy, and fun and easy to grow. If only they would dig themselves up! And here is a not so thrilling picture of our shade planted salad mix, which is one good thunderstorm away from bursting forth. 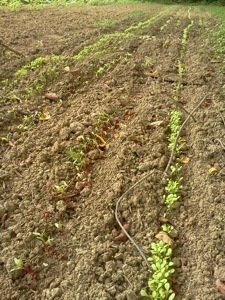 We will hopefully have baby mustards, lettuces, and chard all ready by the en of the month!